The electric surfboard market is rapidly growing with new players launching their E-Surfers every quarter. Reason enough for us to launch an electric surfboard magazine to provide an overview about the different players. Next to the normal electric surfboards which are very similar to a standard surfboard we see a lot of hype around Electric Hydrofoils which let you fly above the water. You will find these in our Electric Hydrofoil section. Another section is about Electric Sup surfboards. Some electric surfboards are using propellers and others a jet engine. In our “compare boards” section you can see the differences between the electric surfboards available. Many of these boards were not for sale before 2019, so we rely on the information we get from the manufacturer website and from our forum. But we usually get access to test boards before they are on sale and will write full reviews in such cases. The first electric surfboards in the market were Onean from Spain, Lampuga from Germany and Waterwolf from Germany which launched 2016/2017. Lampuga went bankrupt in 2017, but opened again in 2018 with a new owner. The Lampuga Air is shipping since March 2019. Like most of the electric surfboard it is using a jet. Onean started with an electric SUP called Manta and an jetboard called Carver. 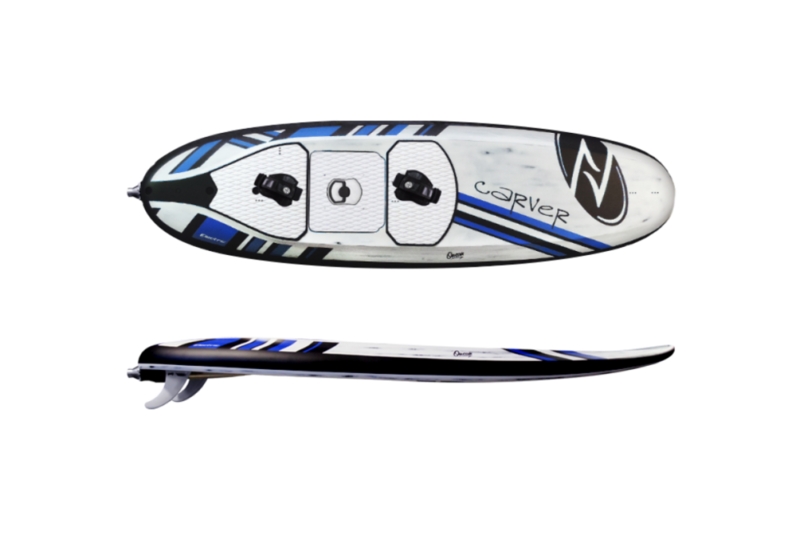 The Onean Carver was probably the most sold electric surfboard until early 2019, but struggled a little bit with power for rider above 80 kg. As a consequence Onean launched the Carver X in summer 2018 with 2 batteries and 2 jet engines, which can handle heavier riders. At the boot show in Dusseldorf in January 2018 a lot of new electric surfboards were announced, but unfortunately most of these boards faced huge delays in delivery. Radinn and Lampuga took another 12 months to start shipping. This is no surprise as this technology is still developing. 2019 seems to be a promising year as many brands are finally start shipping. Onean – The company Onean from Spain has 3 models currently with the Manta, Carver and Carver X. They are also developing a new faster jetboard, but there is no release date yet. 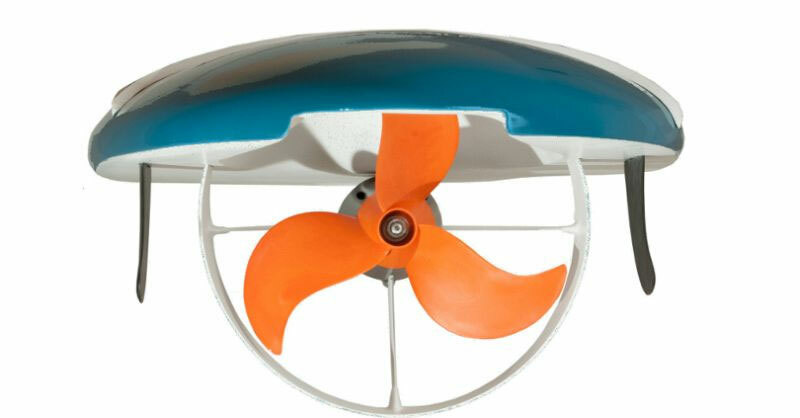 Waterwolf – From Bavaria in Germany ist manufacturer Waterwolf who is still the only brand using a propeller (see picture above). The Waterwolf MPX-3 is selling since 2017. Lampuga – With a new owner, new staff and a new headquarter in Rastatt (Germany) Lampuga is shipping agin since April 2019. The Air model is an inflatable electric surfboard. Radinn – From Sweden ist the company Radinn who sold a few units of their first model (positioned as an electric wakeboard) in 2017 and announced the new GX2 at boot 2018. Awake – Another e-surfboard company from Sweden is Awake who presented their jetboard at boot 2019 and wants to start shipping in 2019 as well. Torque – The electric jetboards from Torque are developed in Australia. They have currently 2 models with Mongrel and Xtream. They also sell electric SUPs since 2019. 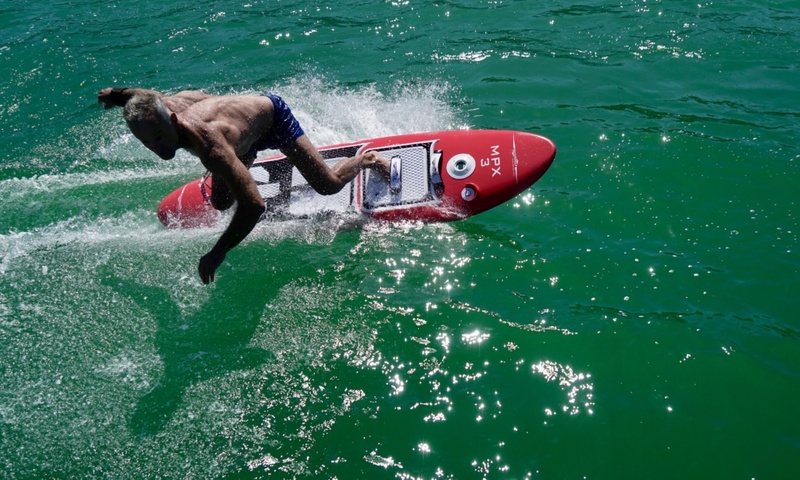 CURF – Based out of Hamburg in Germany CURF is positioning their e-jetboards as the most powerful jetboards on the market which can also tow a wakeboarder. Mertek – Out of Shenzhen in China the company ePropulsion is selling its brand Mertek. A cheap electric surfboard for riders below 60 kg. Most electric jetboards are using a Bluetooth remote control to accelerate the surfboard. Only Waterwolf has a solution where adjust the speed with a knob on the front of the board. This works fine for the Waterwolf as the maximum speed is 25 km/h. Other jetboards however make up to 60 km/h so it is necessary to have a remote control to adjust the speed. 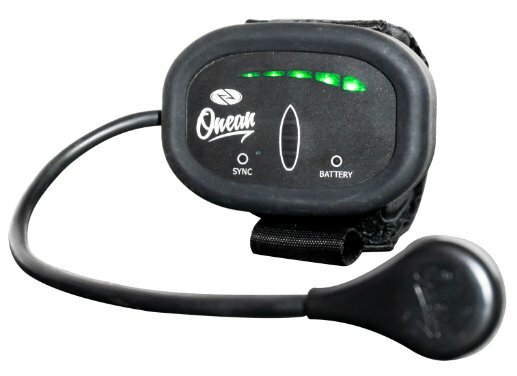 Most remotes are using a trigger like a pistol, but Onean has a pressure sensor for your thumb. The cheapest boards start around 3,000 EUR but lack of power. They usually are only good for riders up to 45 kg. At 5,000 EUR they might be good for riders up to 70 kg, but for heavier riders the jetboards start at 8,000 EUR and go all the way up to almost 30,000 EUR. For a good electric surfboard you should budget at least 10,000 to 15,000 EUR. The prices should go down in the coming years, but currently the shipped volumes are still low. May be 3,000 units until end of 2018. One expensive factor is the lithium ion battery. The battery alone is 3,000 to 4,000 EUR for a proper e-surfboard. The weight of such an e-surfboard is between 27 and 60 kg including the battery. Yes, this is heavy, but once in the water you don’t feel the weight if the board has enough power. The run-time of an electric jetboard is between 20 and 60 minutes depending on the brand, the weight of the rider and the riding style. If you have some water-sports experience such like surfing, wakeboard or kite-surfing you will have no problem to ride such a board in minutes. You steer them like a traditional surfboard. The Waterwolf is closest to the traditional surf feeling while the jetboards are a bit more difficult to carve. Some vendors add rope connected to the top of the board in order to help adjusting the direction. Some times the remote control can be connected to this rope, so you have still one hand free. 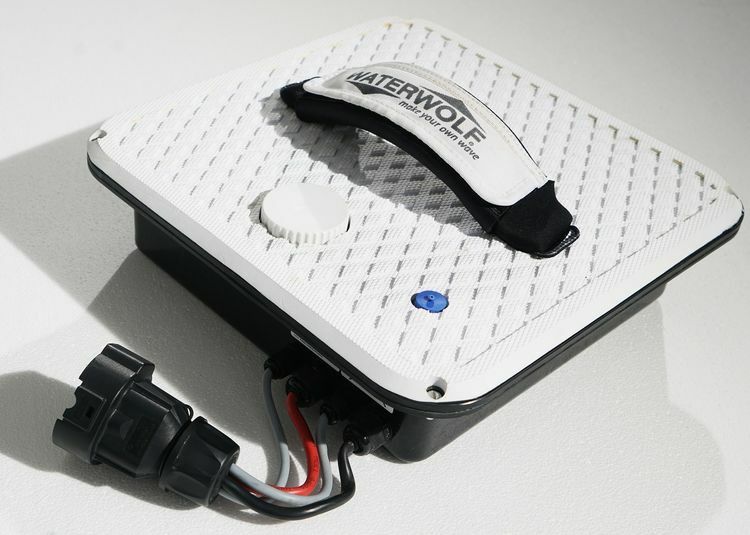 With the Waterwolf you have even both hands free as it has no remote like mentioned above. The surfboards have usually a security leash which protects that the board will go to far after a crash and potentially hit a boot or something even worth. The Bluetooth remote will also turn off the motor once the distance is more than 2 meters. Some of the newer jetboards (which make 50 – 60 km/h) have so much power that they can even tow a wakeboarder or your kids on a tube. Especially for boat owners or people who want to transport their electric surfboard in the car inflatable jetboards are useful. They are not only easy to transport, but also protect your boat against scratches. Most board however however have a hard carbon fibre hull. If you are allowed to use electric surfboards on your lake, rive or on the sea should be discussed with your local authorities. Different countries or even regions with a country have different rules. In Germany for example you need to register it as a small boat and you will need to stick your license number on the board. I am writing this text in April 2019 and I am very much looking forward how many boards will be released this year. It is one thing to announce an e-surfboard and show a prototype, but another to establish a reliable mass-production. Most of the times the boards are 12 months later than originally announced, but this year it should finally work out for some of the current brands. It will be an existing year and will become even better and more affordable over the next years.